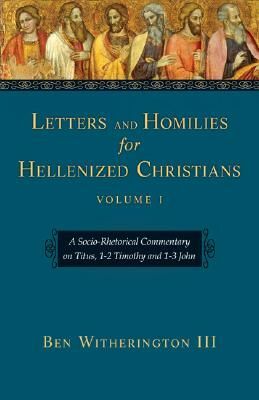 In this socio-rhetorical analytical commentary, Dr. Ben Witherington takes fresh look at the pastoral epistles and Johannine correspondence and provides an analysis of the documents in their socio-religious context discussing their provenance, character, and importance. Dr. Witherington focuses on the unique insights that arise through the social-rhetorical analysis. Throughout, he makes the case for Luke as Pauls amanuensis for these letters, as well as a strenuous argument against New Testament pseudepigrapha. Features: Extended annotated bibliography Closer Look sections address the issue of contemporary theological and practical concern Bridging the Horizons sections point to the relevancy of the text for todays readers.